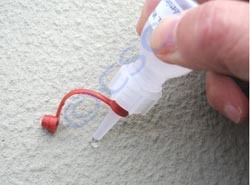 before applying a paint, a plaster, a render or a repair mortar it is necessary to know if the surface to be covered or the material to be repaired is water repellent. By definition a water repellent material does not like water and will reject it. 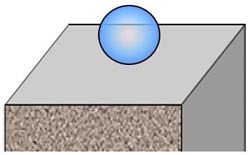 Pratically this means that if you try to put a water drop on a water repellent surface the drop will “refuse” to adhere: it will form a sphere on horizontal surfaces and roll off on inclined ones. Hence the drop test described here after can be applied to determine whether a surface is water repellent or not. 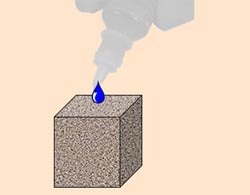 – if the material is non porous, the water drop will humidify the surface and expand over it without being absorbed (b). The water will in this case disapear slowly by evaporation.